Have you ever thought of painting your ordinary, somewhat boring wine glasses to transform them in customized ones? It looks awesome on your set dinner table for Christmas, and it’s the perfect solution for lost glasses at a party because you can write names on it! It’s also a great activity to do with children on a rainy Sunday afternoon or during holidays. And although you won’t let your kids drink wine of course, it looks cool with lemonade too! Cheers! 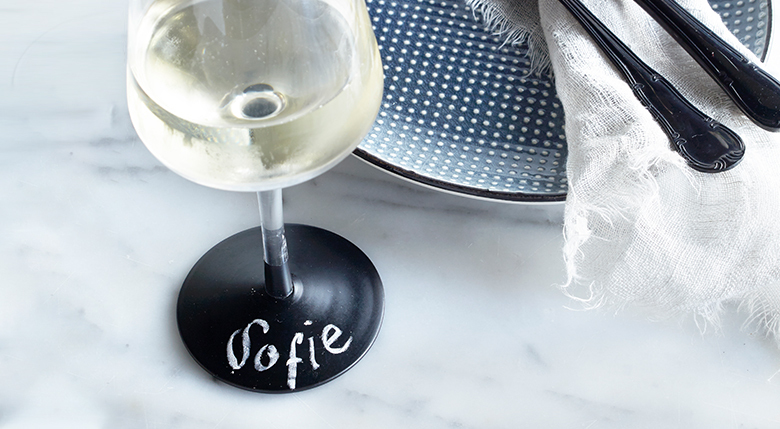 Now it’s time to personalize your glass and write your names on it with a chalk. You can personalize so many everyday home items with MagPaint’s BlackboardPaint. Think of a menu board, cutting boards, mason jars, vases, placemats. So many options! For more inspiration, please check MagPaint’s Pinterest board.